Melon Man LLC of Jordan, MN provides professional handyman services in the Southwest Twin Cities suburbs. 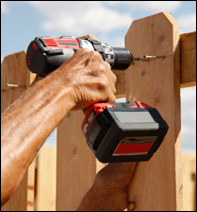 Handyman services can be home repairs of all types including Electrical, Doors & Locks, Cabinets, Plumbing, Fences, Windows, Screens and Much more. 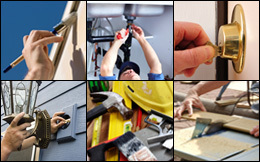 Home repairs, replacements or installations of a wide range of home improvement tasks. When you need a handy man, when you need a Jack-of-all-Trades to help manage your house needs, Melon Man is here to assist you in completing all the work on your "Honey-Do" List. How old is your "Honey-Do" list? When you look around your home, how many small jobs are there that need completing yet never get started simply because they are small? The door that has been sticking for a while, the toilet that keeps on running, splintering deck boards or some rot in the hand rail. What about the ding in the drywall caused by the door handle when the wind caught the door? To many people, these jobs build up over time and yet never seem quite important enough to take care of. You can be dissatisfied with the way the house is, yet who is going to miss their children's activities because a board is loose on the deck? For working parents, the weekend should be time to share with the family, not spend time doing more work! Melon Man LLC was established exactly for the people who want these jobs taken care of and know that even though the jobs are small, having them done by a licensed and insured professional is just as important as if they were an addition on your house or a kitchen remodel. Do you know someone has been at your house? How many times has work been done and once the tradesman has left, on the floor you find dust from drywall, wood shavings or the little colored plastic ends cut from electrical wire? At Melon Man LLC we put covers on interior surfaces to catch the mess; use tools with vacuum attachments so that the job is kept clean as we progress and clean the work site before we leave. Our view is that when we leave, the only evidence of our being there are the improvements that we have completed. "Thank you for doing a great job. I'm glad to know people who take pride in what they do." Melon Man, LLC provides high quality handyman services for home remodeling, house renovations, and repairs for southern Minnesota cities and towns including Apple Valley, Burnsville, Belle Plaine, Chanhassen, Chaska, Eden Prairie, Jordan, Lakeville, Lonsdale, Mankato, Montgomery, New Prague, Northfield, Prior Lake, Savage, Shakopee and all surrounding areas.